Genuine versus generic phone chargers: You pay for what you get. - Digmodo: Gadget reviews and ratings for discerning consumers. In any event, the present post is related to the basic iPhone wall chargers, and we will directly compare two generic chargers versus one genuine Apple charger. Generic versus genuine Apple iPhone wall chargers: Here's what we did. We bought one generic iPhone 4/5 wall charger from EBay (shipped from China), one generic version from a bodega in Queens, NY, and one genuine iPhone wall charger from the Apple store near the Highline in NYC. We tested them in 3 ways. First, we used them for about 6 months, charging phones nearly every day with all three versions. Second, we recorded charging times to calculate averages for each of the three options. Finally, we disassembled all three and looked at the quality of electronic components and assembly. Overall quality comparison: The three chargers looked very similar in terms of overall form factor. There were some amusing differences that you'll notice in the below picture. 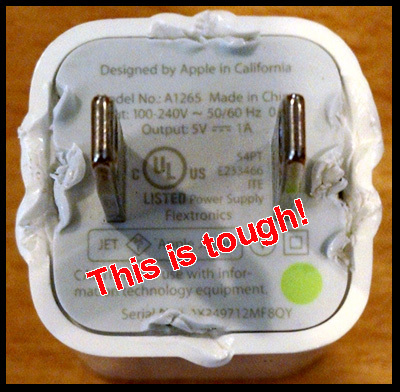 The charger that was purchased on EBay for $2 and shipped from China was labeled as "Designed Abble in California," but otherwise an exact duplicate of the text and iconography of the genuine Apple charger. Overall size and weight was very similar, though the Apple charger was a few grams heavier. You'll realize why when you see the quality of the internal components. Daily use reports: Two of the three chargers made it through all 6 months of use. One of them came apart when we pulled it out of the wall outlet during month 4, leaving the metal prongs in the outlet and the rest of it dangling by two thin wires. Dangerous enough for me to double-check the fire insurance policy for the Digmodo offices. That was the one we purchased at the bodega in Queens; in the picture below, it's labeled as "Generic." Charging times: The charging times were quite similar between the three chargers. Note that the Generic and Abble version made a few of our iPhone 5's throw the incompatible charger error, which sometimes prevented charging altogether. Other times it still charged once we dismissed the warning. Overall, the Apple charger produced average charging times that were faster than the other two, but only by a slim margin of about 6 minutes for a 50% charge increase. Disassembly: Now for the fun part. We disassembled all three chargers to check out the internal components, to check for the quality of the soldering, electronic components, overall assembly and heat protection and insulation. This was easy to do with the Generic charger, which came apart for us in month 4. But for the genuine Apple charger this proved much more difficult. Check out our pry marks on the Apple charger. 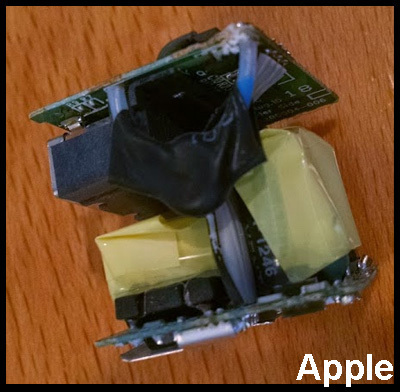 While the other chargers easily pulled apart when pried with a mini screwdriver, the Apple charger wouldn't budge. After about 5 minutes of unsuccessful prying, we had to break out some strong needle-nosed pliers to pull it apart. This is a strong testament to the overall build quality of the genuine Apple charger; the odds of it pulling apart when you yank it out of an outlet are very low. Once we got the Apple charger open, we found that it truly stood out in terms of quality, safety, and overall craftsmanship. First, the Apple unit's circuitry were snugly placed into the case and were the only ones that didn't simply fall out of the case once opened. The circuit boards in the Generic and Abble units simply fell out of the case and split apart into two separate circuit boards held together by a ribbon cable. The overall quality of the circuitry was far better in the Apple unit. First, only the Apple circuit board is green due to a laminate soldermask that controls solder placement during manufacturing and prevents solder bridging. It is much higher quality (and more expensive to produce) than the brown circuit board material you see with the Generic and Abble versions. Second, the Apple board held two 400V capacitors while the others were of mixed lower voltages. The list goes on. 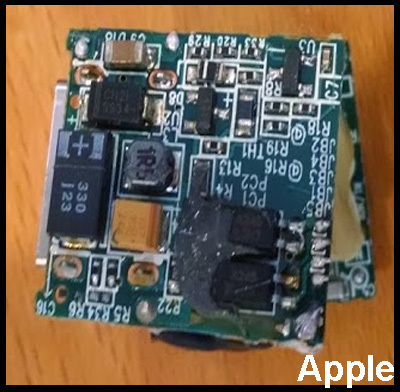 The Apple unit was the only one with an insulated USB port metal frame, insulated capacitors and transformer, a fully labeled circuit board, and for better or worse a chipset that identifies it as a genuine Apple product. We were concerned about the Generic and Abble versions, as they had inadequate insulation between interconnection points that should never be connected, conductor spacing not meeting minimum IPC-A-600 specifications, ambiguous component quality, and no traceability such as unique circuit board part and revision numbers. There was also no indication of an onboard IC component to prevent overheating and short-circuiting. The Verdict: Given the results of this comparison, including inferior charging performance, build quality issues, and poor internal component quality, we strongly advise avoiding discount car or wall chargers. We are in no way affiliated with Apple or any other manufacturer of cellular phone accessories, so this is a truly impartial conclusion. Had we found no overall performance or quality differences between the chargers, we would have recommended saving the money. But given the risk of fire, electrical shock, and premature failure, we cannot recommend anything other than genuine or brand name (from major manufacturers) products. This is the case not only with Apple chargers, but also with other companies such as with Samsung chargers, Nexus chargers, and Motorola chargers. Major corporations generally do a better job maintaining international quality and manufacturing standards. Digmodo Recommendations: We suggest purchasing car and wall chargers from the manufacturers of the original devices, or other major corporations such as Vinsic, Belkin, Powergen, RAVPower, and Anker. In fact, if you want an inexpensive charger that is high quality and backed by the reputation of Amazon, check out the AmazonBasics charger series. All of these companies manufacture products to OEM specifications. Importantly, they also won't trigger the iPhone incompatible charger warnings. Generic versus genuine Apple iPhone car chargers: Last year, we conducted three long-term tests of 6 different iPhone 4 and iPhone 5 car chargers: 5 generic products purchased on EBay, and 1 genuine Apple charger. This test was pretty simple: plug the chargers into our writers' cars, use them on a semi-daily basis, and see how they fare. Well, of the generics, 2 failed within a month, 1 failed in the third month, 1 met a fiery demise and melted in the car, and 1 is still working to this day. The genuine Apple product is still working as well. Two out of three is good enough for a rockstar, but one out of five is really quite bad.